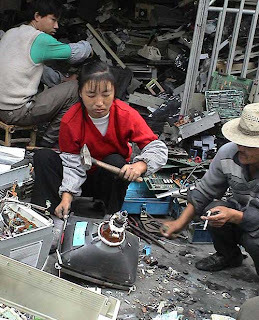 Good Point: Ethical Electronics, Recycling "e-Waste" Blog: EWaste's "Breaking Point"
We'd all be horrified if it was reported that some USA humane societies were sending kittens to foreign countries, where starving people were cooking and eating the kittens. In reaction, a pledge not to export kittens to developing countries seems natural. 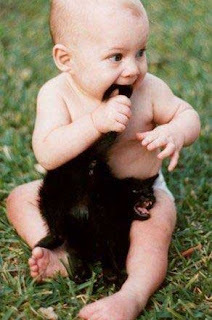 But if the result is that humane societies start to euthenize all kittens, you might want to check out whether most of the kittens sent overseas were in fact being cooked and eaten, or if 80% of them in fact were winding up in good homes, and the initial story was anecdotal. That would require math. Instead, the NGOs are trying to make a "no intact kitten" policy seem like it is superior to the hard work of finding good homes for kittens. The "no intact kitten" policy has reached a breaking point. The competition between two "certification" standards for electronics scrap ("e-waste") operations continues to dominate policy debate. From EPA's Responsible Recyclers (R2) certification, the discussion moved to ISRI Policy. Although reasoned debate always seems to result in "qualified exports", BAN moves the no-intact-unit, no-reuse standard forward on their own, usually by getting an organization like NRDC on board. Now the discussion has moved to EPEAT. Had the NGOs (BAN, ETB, NRDC) been able to compromise on the export issue, I'd still be friends with them and we'd put our combined energy into enforcement and recruitment, and some new directions I plan to announce later. Instead, they have broken off discussions, do not respond to allegations that their standard promotes shredding, and refuse our offers to seek dispute mediation with organizations like Resolve. BAN has attacked UNCTAD, attacked EPA, attacked R2, attacked ISRI, attacked the manufacturing takeback factory in Indonesia, attacked Samsung for using recycled glass cullet instead of mined ore. Along the way, they have picked up support from some extremely reputable organizations, such as the Natural Resources Defense Council, quoted from the Boston Globe. To be clear, NRDC above says hat the factories which repair monitors under warranty are ok. They also site "documentation", which is what I've been begging for ("math"). But the article is attacking a factory which takes back monitors, including ones to be repaired under warranty! 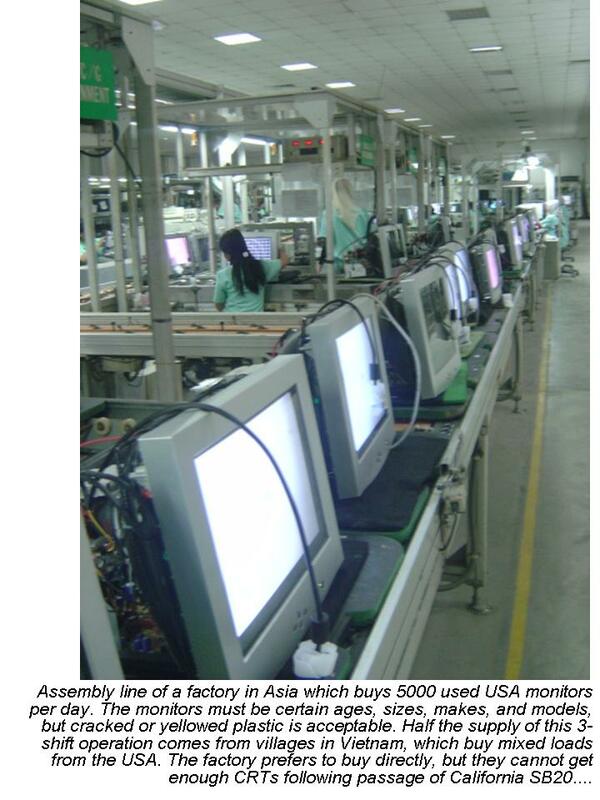 E-Stewards disqualifies the factory taking the exact same monitor back for the exact same process! 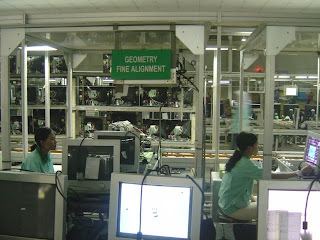 The E-Steward standard disqualifies the largest manufacturer-takeback operations in the world (like the Indonesia factory pictured), which are also the largest export demand in the world. The factories, with connections to Wistan, Foxconn, BenQ, Proview, and other contract manufactures, made practically all the computer monitors in the 1990s, and have more than enough talent and engineering to repair and indeed recycle them. That was another "breaking point". The paradox is that the NGOs are promoting "manufacturer takeback" while excluding the very factories which manufacture the electronics. I don't know if this is from ignorance or if paradox equals job security. The "primitive wire burning" operations are the same ones many if not most of the OEMs rely on to make their products, and many of them already have ISO14001 because they had to get it for contract manufacturing contracts. Now the difference appears to be a piece of paper, a "warranty", which makes the same people doing the same thing to the same monitor either "primitive" or "sophisticated". The story is coming out. We are seeing chinks in the armor. BAN knows they are wrong. A lawsuit is reportedly in motion, in reaction to the arrogant attack on the Indonesia factory BAN slapped out to Boston Globe and others last February. Rest assured, if BAN calls in MY containers to the customs agents, which I have sent to an audited, legal, accountable refurbishing factory, and states that they do NOT meet the specifications of the factory, yet accept the same factory as an option for "warranty" items, and then accuse me of being a bad exporter to my clients and to the press, I will sue them back to the stone age. We do not dispute the anecdotes, and we are working on making the process of reuse better and better. The piles of waste CRTs in the BAN photos in China were CRTs which could not be used by the factory, they were outside of the purchase order (e.g. screen damaged, or trinitron R4 displays), and the reaction to the export of off-spec material should be to return or pay for proper recycling of the off spec material, NOT to ban the trade in ON-Spec material. In my opinion, E-Stewards clearly does the latter, labelling commodities as wastes based on outright deception, e.g. their hoodwinking of CBS 60 Minutes on the "trail" of the CRT monitors in Hong Kong (NOT GUIYU!!! NOT GUIYU!!!). The BAN e-Steward ewaste standard is easy to obtain if you adapt a no-intact-unit standard. Requiring the monitors to be tested and repaired in the USA prior to export is so difficult that it results in shredding up working monitors. They allow the shredders to then imply that the manufacturing factories, the warranty operations, are depicted in Guiyu. But Jim Puckett of Basel Action Network said those assertions defy belief. Research his group has done shows that 75 percent of CRT tubes sent overseas do not work. Testing should be done on each one, he said. Let's see the "documentation", let's see the math, how many monitors are working when tested, and how many monitors are being shredded vs. sold for reuse. I have records (as required by EPA) of final reuse and management of hundreds of thousands of monitors, and offered the same to BAN if they would accept the factories pictured here. BAN said they would not, under any condition, accept factory refurbishment, no matter what proof or documentation I provided. WR3A members have now visited the contract manufacturing factory in Indonesia, the one in question by the Boston Globe press article where NRDC Senior Scientist Dr. Allen Hershkowitz is quoted. EPEAT has enough electronics manufacturing expertise to understand the reprecussions of profiling Foxconn, Wistron, BenQ, Proview etc. in bigoted manner. NRDC has sided with the John Tierney (author of Recycling is Garbage, which NRDC and I worked together to rebut in the 1990s). The key difference between R2 and E-Stewards is BAN's claimed interpretation of Basel Convention Annex IX, B1110. (BAN's apparent interpretation of the Basel Convention's repair and refurbishment allowance is belied by their own letters to the Secretariat protesting it as written). E-Stewards does not allow a perfectly good manufacturing operation to take back its own products. Seagate in "primitive" Singapore cannot take back hard drives, for example. Why would it be ok for Seagate to take back my hard drive if I kept the warranty paper, but would be "poisoning people" if I did not have my warranty paper? Can this entire dispute be resolved with a longer warranty? The US Commerce department needs to weigh in here, as through EPEAT the EPA are at risk of promoting a standard which is in conflict with USA positions at WTO, that commodities are not wastes if certain tests are met ("fully functional" definitely not being one of the tests). The USA has core refurbishing operation, like Catepillar and Cummins Engine and VideoDisplay Corp, which have been victims of other countries labelling their cores "wastes" as a predatory trade practice. EPEAT needs a recycling standard which discourages shoddy and sham recycling, or which culminates in "toxics along for the ride". It does NOT need to take sides on the Annex IX "debate". Like NEPSI and other "consensus" standards, EPEAT risks "apparent consensus" actually based on "last man standing". The person with the biggest investment makes it to all the survey monkey polls and all the calls, people with less bias have less at stake and cannot justify as much participation. The paper shredding industry did that in the 1990s and it resulted in closure of USA paper mills which were too busy making paper to go to meetings setting standards for paper shredding. FOOTNOTE: The original Boston Globe story by Beth Daley has been rewritten following the criticisms posted in this blog.